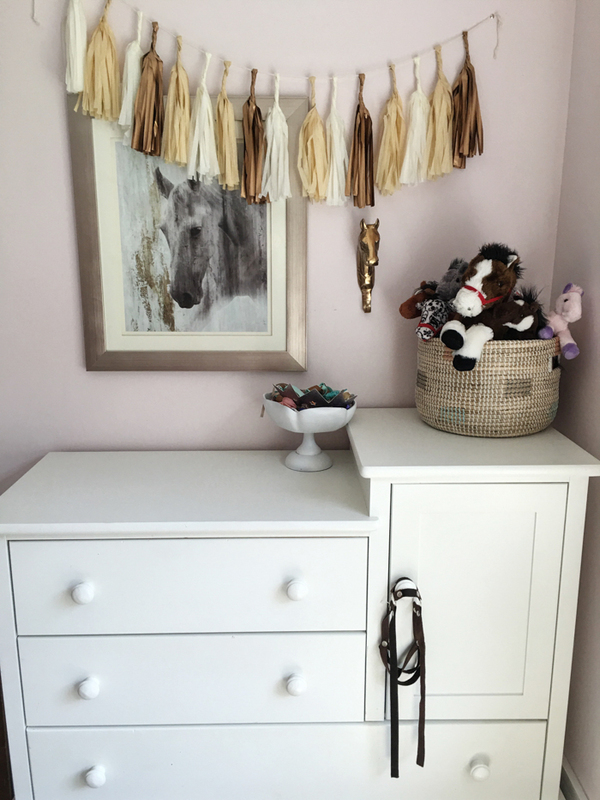 Lauren Rebecca: A Horse Bedroom For Scarlett. 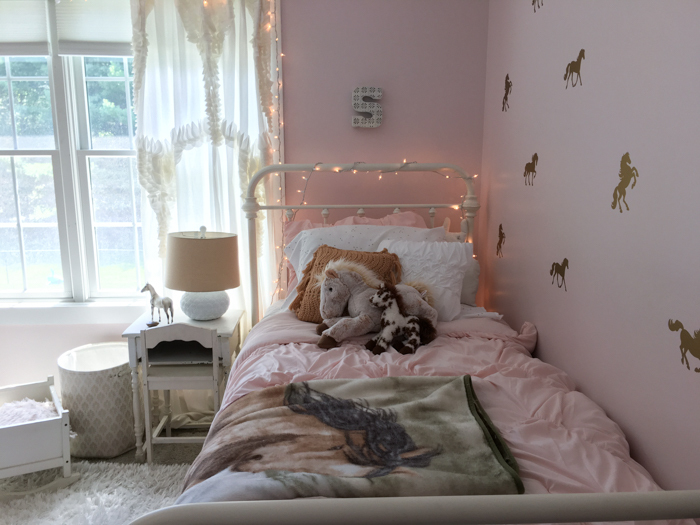 A Horse Bedroom For Scarlett. Scarlett has had a few different rooms in her short life time. As she gets older, I like to change her room up every now and then. But I didn't want to spend a lot of money since she grows so quickly. Not only that, but as soon as Summer nears end, I begin major house overhaul or Fall Cleaning, if you will. Getting rid of anything that we don't need and prepping for that transition of seasons when we will spend a lot more time indoors. As we all know, Scarlett is really into horses. 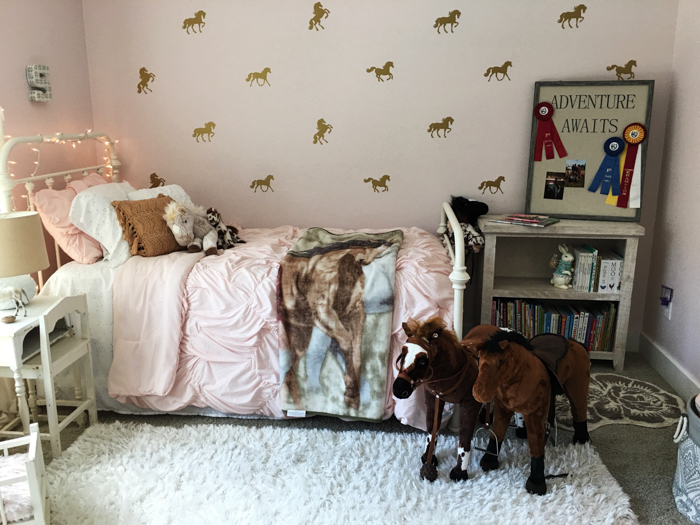 So I thought it was fitting to create a horse-themed room for her. I thought about painting her room but she insisted on keeping the pink. Instead I found some horse decals on Etsy and Ty and I found them really easy to put up. Also, they aren't permanent so they will make for easy take-down. Living in Saratoga, any horse artwork or prints are priced ridiculously! I found a horse print at HomeGoods that was only $29.99! Steal. I also found the brass horse hook for $6.99. I took a rug from another room and the garland from her 4th Horse Birthday and used them to decorate. A few horse stuffed animals here and there and I made the happiest 5 year old I know! I bought the horse decals HERE if anyone is wondering. I also took out a large amount of toys which has made clean up of her room so much easier! All the toys went to the play room closet. I will post about that soon. If any of you saw my SnapChat posts of Scarlett seeing her room for the first time (laurenrebecca44), you know that she was thrilled with all of it! Easy little make-over for the start of Fall. This is so cute! I love her bedding! Her room(s) have always been adorable!! Your a great decorator!! My life would be so much less complicated if I could find a way to rid ourselves of so many toys.. but I'm such a hoarder. Just about every.single.toy has a little memory with it & I can't bring myself to get rid of it!! 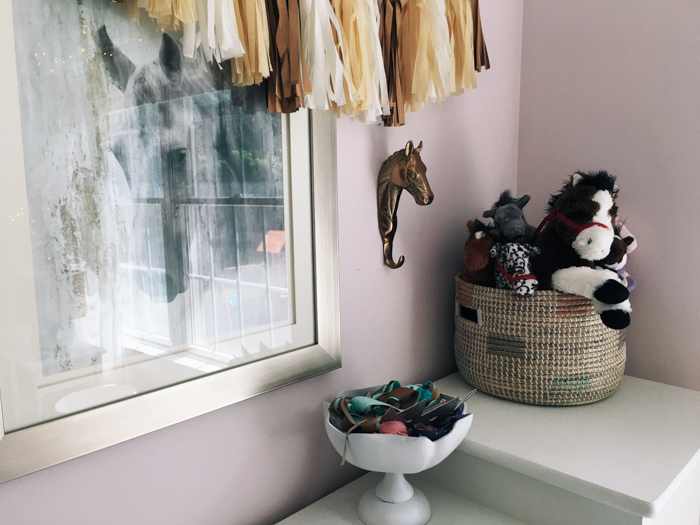 :( I can't wait to see how you organized a playroom closet! !